Global cities with a largely cosmopolitan environment, such as Auckland, Berlin, Dubai, London, New York, Shanghai or Singapore, are successfully developing and attracting entrepreneurs from all over the world. This book elucidates the policy approaches related to the formation of the cosmopolitan environment that supports entrepreneurship in large urban areas. The book’s core theme is the relationship between cosmopolitanism and entrepreneurship whilst the latter is viewed as a key driver of economic growth, sustainability and prosperity. The book argues that successful entrepreneurship rests on the two pillars of the cosmopolitan environment – diversity and the creation of business opportunities. In contrast to globalisation’s standardised solutions in policy, commerce, banking and social issues, cosmopolitanism allows individualised value and solutions, whereby actors – entrepreneurs, businesses, families, interest groups, governments, NGOs and virtual communities – enjoy diversity as a norm. The book pays special attention to under-researched topics, such as threats to sustainability in cosmopolitan cities; why cosmopolitan cities attract immigrants with a highly independent mindset; the impact of religious norms on female and male entrepreneurs; varying experiences of local and expatriate entrepreneurs; and the differences in doing business by female entrepreneurs, stemming from their nationalities and residence status. 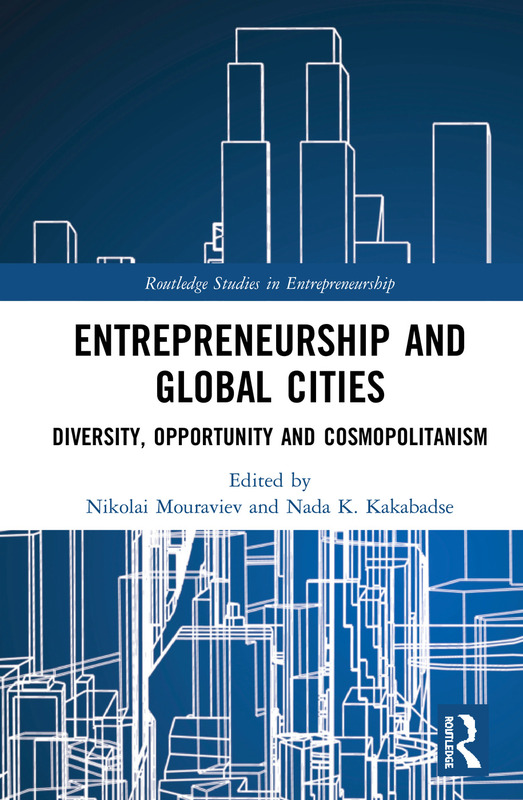 The book offers conceptual insights into the enablers of entrepreneurship in cosmopolitan cities and urban governance, complemented by case studies based on the field work in Dubai, Hamburg, Istanbul, Karachi, Kyiv, London, Moscow and Tel Aviv. The book will appeal to those who study or teach cosmopolitanism, globalisation or urban development concepts and those professionals who consider the possibility of doing business or working as an expatriate in a cosmopolitan city. Dr Nikolai Mouraviev is a Senior Lecturer in Business and Management at Abertay University, Dundee, Scotland, UK. Previously he has held teaching positions at KIMEP University, Kazakhstan, Wayne State University, US, and Viterbo University, US. His research focuses on public-private collaboration and governance in transitional nations. Dr Nada K. Kakabadse is Professor of Policy, Governance and Ethics, Henley Business School, University of Reading, UK. Prof Kakabadse has extensive experience of researching governance, leadership, top teams, boards and directorship. She has co-authored twenty-two books and has published over 200 scholarly articles.